For the series announcement and the question to which I am replying, see here. I believe that the dichotomy between the “intellectual” and the “spiritual” in religious education is a false one. Instead, I would prefer to appropriate for my approach to this important issue the German adjective geistlich (or Hebrew ruchi): a word that sees the spiritual and the intellectual as part of a synthetic whole that also includes an appreciation for the aesthetic. I believe that by adopting this perspective one may more fully comprehend, and so more successfully fulfill, the scriptural injunction to seek God with all one’s heart, soul, and mind (Mark 12:30). Moreover, this approach attempts to eliminate the dualistic impulse that tries to separate the spirit from the material, an impulse which I believe Mormonism confronts and rejects (D&C 88:15; 131:7). Of course, one could easily recall numerous Mormon axioms for the importance of the life of the mind, including, “The glory of is intelligence” (D&C 93:36), and the divine command to obtain out of the “best books words of wisdom” and to “seek learning, even by study and also by faith” (D&C 88:118; cf. D&C 90:15; 109:7, 14). But I believe that perhaps the best argument from a Mormon perspective for the organic integration of what is sometimes artificially conceptualized as a division between the “mind/intellect” and the “spirit/soul” is the Prophet Joseph Smith himself. Here Mormons have an authoritative religious example who valued and who aspired to combine truths of personal experience, divine revelation, and academic study. He was brave enough to question and to study things out in his mind (cf. D&C 9:8), while also being humble enough to seek out answers from both God and the collective wisdom and learning of other peoples, faiths, and traditions. He truly was an example of learning “by study and also by faith,” someone who fully believed that Mormonism could bravely accept all truth, whatever its source. Although requiring methodological rigor and pedagogical sensitivity, I genuinely believe that Mormonism has nothing to fear in studying or honestly teaching the methods and results of modern academic disciplines. Indeed, I maintain that such geistliche Studien in fact are a divine obligation that will only enrich an already wealthy tradition that I deeply love and cherish. And, finally, I believe that such engagement is crucial if Mormonism wishes to retain and nourish its rising generations in this ever-increasingly globalized world, and also if it wishes to make an even greater contribution in the next century to that broader world it is called to serve. The Flood: Global or Localized? With the rising tide of modern science, historical criticism, and other scholarly disciplines, those committed to a strict literalist interpretation of the Flood stories in Gen 6-9 have had to retreat farther and farther up the metaphorical beach in order to maintain their belief in the historical reality of the Biblical tale. For instance, basic problems with a literal reading of the narrative include the fact that there is no geological evidence for a global flood, and that the Biblical Flood narrative in large part is derivative of an older Mesopotamian Flood story from the myth Atrahasis (among many other reasons). Sometimes, though, more liberal readers of the text suggest that the Flood was a historical event but that it was localized in a specific area, and that from the shortsighted view of the ancient author the whole land (including the mountains) indeed was covered with water. Thus we shouldn’t expect there to be evidence in the geological record for a global flood. However, there is, in my view, a more adequate understanding of the text, one that takes it on its own terms. 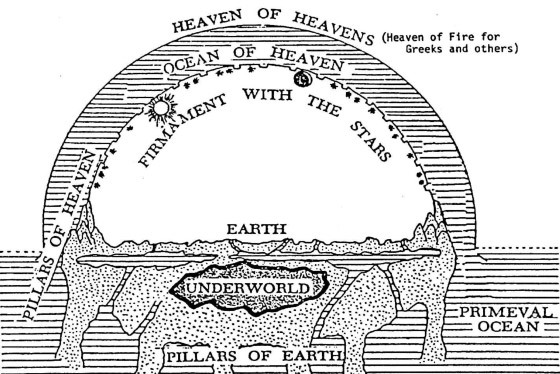 Israelite cosmology as it is reflected in the Bible basically consisted of a three-tiered world with the heavens/sky above, the earth below the sky, and the waters below the earth. In the heavens (which, for some authors, had multiple levels) the gods resided, while humans lived on the earth. Moreover, Israelites believed that there was water above the earth, presumably because the sky, like the sea, is blue and, moreover, rain would often come down from the sky. In this pre-scientific worldview there was a solid, clear (perhaps ice or crystal?) dome-like structure that prevented the waters above the earth from crashing down onto the earth. This material object is translated as “firmament” in the KJV in Gen 1. The so-called “windows” of heaven were, in their view, sluices cut into the dome through which YHWH would send down rain according to his providence. The sun and the stars were underneath this solid dome. Furthermore, pillars were sunk into the subterranean waters to support the earth, and below the earth was also She’ol, the underworld. Mountains, on the other hand, were thought by some to support the dome. For more visual readers, see HERE for a basic representation of this cosmological worldview. Gen 1 describes creation as a divine process of organizing the world from the chaotic primeval waters by separating different elements so as to provide order. The Israelite God separates the waters using the dome in order to create the sky and then, within this “bubble,” proceeds to organize the rest of the world through separation and demarcation. Just as, on the social level, God separated the Israelites from the other nations and gave them his covenant and its attendant laws in order to organize their lives and provide them with well-being, so too, on the cosmological level, proceeded the creation of the world. The formation of the world, in a sense, mirrored the creation of Israel, and vice versa. Thus it would seem somewhat unfair either to criticize or to validate – on scientific grounds – the author(s) of the Flood stories by measuring their texts against the ruler of modern scientific cosmology. The Flood stories do not comment upon whether the Flood was local or global in scientific terms; indeed, their view was pre-scientific. Rather, for the Israelites who authored these stories the Flood primarily represents “uncreation”: that is, the disorder and chaos that existed before God’s mastery over creation brought order. When sin filled the world the God of Israel unleashed the subterranean and heavenly waters to fill the bubble. So too if Israel transgressed its covenant and failed to keep the laws of YHWH their society would fall into chaos and ruin. Liturgy is prescribed or ritualized forms of public worship. For instance, the LDS Sacrament (= the Eucharist) is a Mormon liturgical practice. The question I pose is as follows: to what extent is Mormon liturgical practice appreciated in the development of Mormon theology? That is, how does the Sacrament ritual, hymn singing, the standardized Sacrament Meeting routine, traditional baptismal services, normative forms of public prayer, etc., reflect and inform the creative efforts of (modern) Mormon theologians? Since public worship of deity is of central religious importance to Mormonism, it would seem that such living communal practices among the body of believers could be as useful for theological creativity (as well as spiritual formation) as are, for instance, the Scriptures, the sermons or writings of modern General Authorities, or statements from Joseph Smith or Brigham Young. But what are the limitations of Mormon liturgical practice for informing its theology, since, for example, Mormon liturgical practice has been, and still is, subject to modification, and much of it has not been “canonized” (if I may be allowed to borrow the term) like the Standard Works have been? Further, the non-public rituals of the Temple cannot be fully incorporated. Nevertheless, it still seems strange to ignore this body of public religious practice in Mormon theologizing since it is so pervasive and seems so essential for individual spiritual formation, as well as for both individual and collective religious identity. Moreover, an emphasis on Mormon liturgical practice in the creation of theology could be beneficial for clarifying LDS beliefs and attitudes on certain subjects vis-a-vis the teachings or doctrines of other social or religious groups when traditional methods of engagement (Scripture, philosophy, etc.) have proved inconclusive or fruitless. How, then, do you understand the value of liturgical practice in Mormon theologizing, and how do you think it could be incorporated more effectively into that project? Jude 1:5-7 (NRSV): Now I desire to remind you, though you are fully informed, that the Lord, who once for all saved a people out of the land of Egypt, afterwards destroyed those who did not believe. And the angels who did not keep their own position, but left their proper dwelling, he has kept in eternal chains in deepest darkness for the judgement of the great day. Likewise, Sodom and Gomorrah and the surrounding cities, which, in the same manner as they, indulged in sexual immorality and pursued unnatural lust, serve as an example by undergoing a punishment of eternal fire.